Home > Solar Power News > What do lions, flashlights and solar power have in common? What do lions, flashlights and solar power have in common? Solar electricity has been used to power all manner of interesting inventions over the years, but one Kenyan boy has used it to help out his local community. When most of us think of solar panels, we envisage fairly big installations of the roofs of houses and offices, but the truth is they can be just as handy on a smaller scale. Aged just 11, Richard Turere decided to take action to prevent livestock in his local area being attacked by lions. He lives on the edge of Nairobi National Park and realised that lions didn't go near the homesteads whenever anyone was walking around with a flashlight. As a result, he grabbed a number of broken flashlights and rigged them up to a box of switches and an old car battery powered by a solar panel, reveals the Friends of Nairobi National Park blog. At regular intervals throughout the night, the lights are switched on to give the illusion that humans are patrolling the area, therefore keeping those pesky lions at bay. Since the solar power invention became operational two years ago, the family has not lost any of its livestock to lions – leading five other local families to ask for a similar system to be installed. 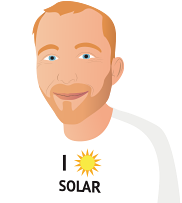 Richard has since been granted a scholarship for his adventures with solar power, with experts recognising just how great his invention is. Not only is it cheap to produce, but is also locally made, cost-effective and easy to install and maintain. There's even potential for the product to be scaled-up and used as an effective means of protecting livestock. It just goes to show that solar electricity has more uses than many of us may realise…who knows what people will come up with next!